The University Medical Center Göttingen is a tertiary care center and offers great development potential. Its 7,900 employees work in over 65 departments and facilities to provide top-quality patient care, excellent research and modern teaching. Göttingen, “City of Science”, located near the center of Germany, the University Medical Center Göttingen is embedded in the city’s attractive network of scientific research facilities. We are looking for excellent and highly motivated individuals with a strong background (first degree) in natural or life sciences (physics, chemistry, mathematics, computer science, biology, neuroscience and cardiovascular research) with an interest in joining one of the interdisciplinary research areas of our Cluster of Excellence "Multiscale Bioimaging: from Molecular Machines to Networks of Excitable Cells" (MBExC). Students are expected to enroll in one of the relevant PhD programs of the University of Göttingen (e.g. GGNB, http://www.uni-goettingen.de/en/56640.html) and can become member of the new Hertha Sponer College of MBExC upon nomination via a performance-based selection process. 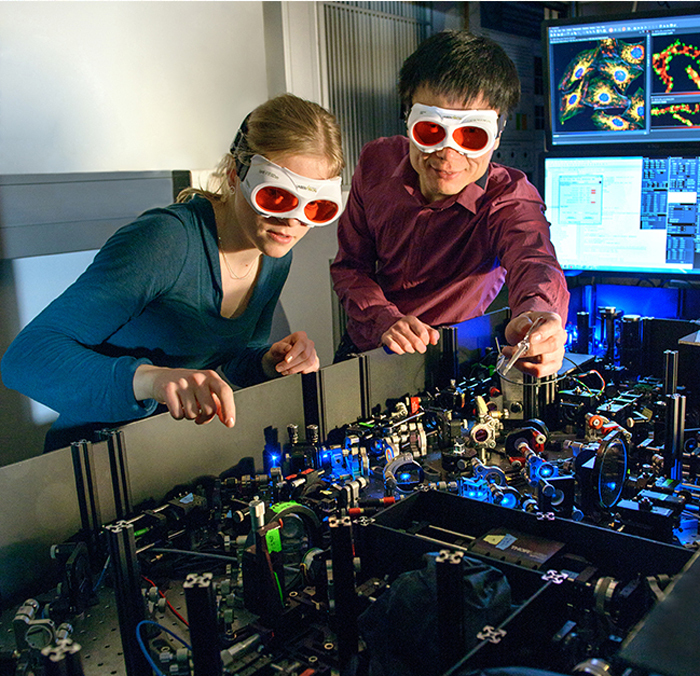 MBExC is a research center of the University of Göttingen/University Medical Center Göttingen and pursues a novel research approach linking photonics, molecular biosciences, neuroscience and cardiovascular research. The goal of the MBExC is to decipher disease-relevant nanoscale functional units in neurons, sensory cells and cardiomyocytes and to develop innovative therapeutic strategies for disorders affecting the heart, the brain, or both. By a multiscale approach the MBExC will uncover fundamental biological principles at increasing levels of complexity from molecular, nanoscale to network and organ levels. The MBExC research program covers gene expression and regulation, protein assembly and targeting, Ca2+ signaling and Ca2+ triggered membrane fusion as well as the development of innovative research techniques. The MBExC relies on a close interdisciplinary collaboration between the University Medical Center Göttingen and the Faculties of Chemistry, Physics, Mathematics and Computer Science, Biology and Psychology of the University and the non-university research institutions in Göttingen, such as the German Centre for Cardiovascular Research e.V. (DZHK), the German Center for Neurodegenerative Diseases e.V. (DZNE) and the Max Planck Institutes for Biophysical Chemistry, of Experimental Medicine and for Dynamics and Self-Organization. Please incude in your application a cover letter, CV, list of publications (if applicable), names of possible referees, and relevant certificates. For further information please contact Dr. Fritz Kobe, Scientific Coordinator, Multiscale Bioimaging Cluster of Excellence (contact details below). Women are especially encouraged to apply. Applicants with disabilities and equal qualifications will be given preferential treatment. Please send your application only via e-mail as a PDF-file. Travel and application fees cannot be refunded or transferred.